In April the Qatari royal family spent $2.3 Billion to buy Harrods, the high end UK department store. 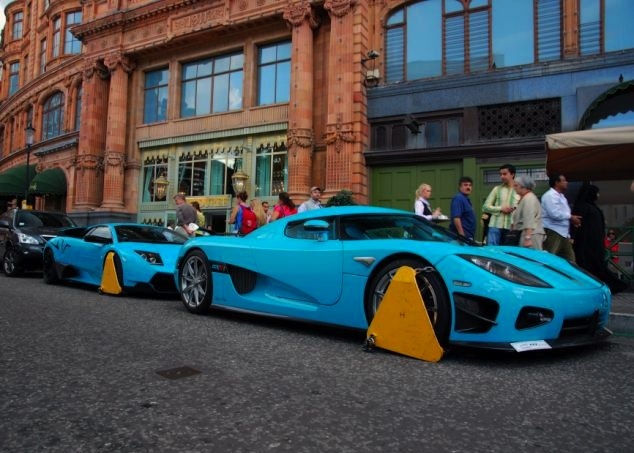 Now they'll have to fork over $800 in fines to remove wheel clamps from supercars worth $2.3 Million that two family members parked illegally out front of the store. The story about these two cars alerted us to the fact that central London has become a weekly supercar show during the summer months with literally hundreds of exotics ranging from the pictured Koenigsegg CCXR “Special One” to a half dozen Bugatti Veyron, including the ultra exclusive '15-of' Sang Noir through to a dozen or so garden variety Lamborghini Murcielago LP 670-4 SuperVeloce, all wearing Qatar number plates. Not bad for a country that was a former pearl-fishing centre, one of the poorest Gulf states and still has less than half the population of New Zealand. They are now one of the richest Gulf countries, in a region full of rich countries, thanks to the exportation of oil. The London supercar parade is a graphic illustration of what the Washington Post calls “The biggest transfer of wealth in history”. Because we are all limited to using an Internal Combustion Engine (ICE) for propulsion, we are forced to consume 6x more energy than is needed to move a car down the road. Good if you're in the business of selling oil, not so good if you just want to drive to work. Each time you fill your car's fuel tank remind yourself that every ICE powered car consuming all this Arab oil is only 15% energy efficient. The direct result is that $0.85 cents out of every dollar you spend at the fuel bowser gets converted into waste heat as an unavoidable side effect of the extremely inefficient internal combustion process. On first appearances it 'looks' like Volkswagen (owners of Bentley, Bugatti, Lamborghini, Audi etc) are doing fairly well out of this transfer of wealth too, until you learn that Qatar Holdings, the same company that bought Harrods, also own 12.3% of the VW group. The Qatari royal family members seem to be keeping it in-house, mostly buying and promoting their family owned brands. We can be fairly certain none of them would be caught dead parading around London in something like a Tesla Roadster, especially one with 'LOL OIL' number plates. Income distribution in subdeveloped countries promotes poverty of many, while only one family, for some religious or socio-cultural tradition is privileged. However, the end is always the same: After the cycle of wealth, the family will live in Europe, takes out what's left of their wealth and leave the miserable people of his country crying out desperately for food and water. Surely, then, Europe is the first to be sought, with desperate pleas for help and humanitarian aid. This Qatar family is already preparing his millionaire nest in England and tests the electric car, to scale the size of the threat they pose to their only source of income. So, they become as ignorant as their subjects or as their oil burning itself, virtually a inexhaustible source of wealth, if used as the largest and easiest organic substances source on the planet. The absorption refrigeration system is older and more energetically favorable than the compression system. Unfortunately, the fluids used are chemical pairs of lithium bromide (LiBr) / water or ammonia (NH3) / water, both highly unhealthy and therefore unsuitable for use in cars. However, as many studies are made to increase the efficiency of ICEs they could find a new chemical absorber pair, with no harmful chemicals, as a way to leverage the huge amount of lost heat by these engines, by replacing the compression process by absorption system, with a large gain in energy eficiency. It would be a justifiable reason for ICE survival.